Bonaventure Fandohan might not use the word feminist to describe himself, but that’s exactly what he is. As an International Development Professional and a native to the West African country of Benin, Bona (as he’s called by his friends) is all too familiar with the gender discrimination that accompanies life in the developing world. While leading our team in Haiti as buildOn’s former Country Director, he worked hard to influence gender equity in the villages he visited. Whether by encouraging women to take a lead role in the school’s planning or by enforcing buildOn’s requirement that girls attend the new school in equal numbers to boys, he was changing the lives of women in some of Haiti’s economically poorest communities. But one day, on a school construction site, he noticed something was off. About that time, Bona was introduced to Nick Troutt, a German-American who moved to Haiti with one goal: to teach proper masonry skills in order to save lives. A lifelong mason by trade, Nick was devastated after learning that much of the death and destruction from the 2010 Haiti earthquake was caused by faulty brickwork. Nick’s goal to teach proper trowel and bricklaying technique lined up well with Bona’s desire to see more women on the worksite. They began targeting women in buildOn villages to learn technical masonry skills and buildOn Apprenticeships were born. 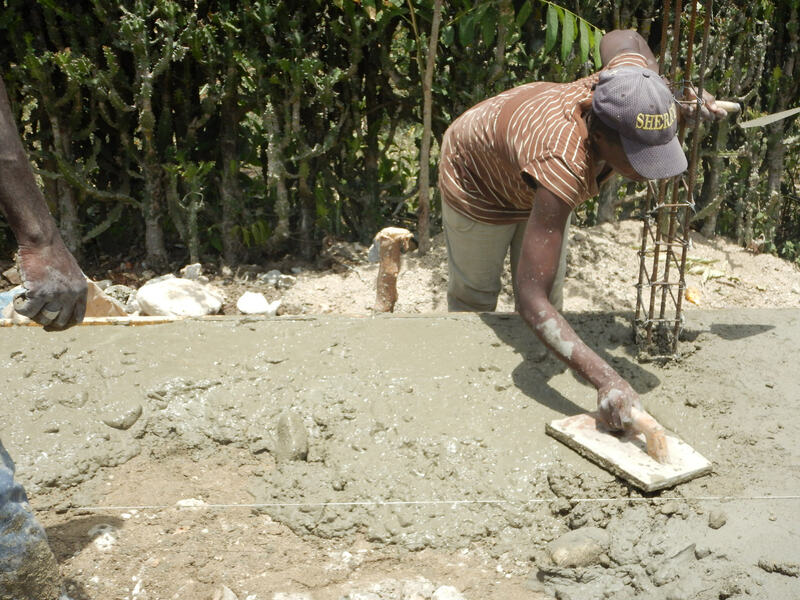 An apprentice lays the foundation of a new buildOn school in Haitian village. When buildOn partners with a village to build a school, buildOn Apprenticeships are introduced to all members of the community, both men and women. To qualify for the program, one must show up to volunteer on the school’s construction site every day, be able to question the skilled labor team, and register with buildOn’s team of skilled laborers. If a woman in the community comes every day to the worksite, volunteers and works hard, she can be recommended to attend a skilled masonry workshop, taught by Nick. buildOn holds two workshops a year where women are taught proper trowel and bricklaying technique. Although the workshop is open to both sexes, Nick contends that his best students are: the women. Prior to her involvement in a buildOn Apprenticeship, Josile Andrise was struggling to make ends meet while living in a straw house with eight other adults and her two children. As a child, Josile was full of determination, walking 60 minutes each way to attend primary school. But, without the resources or support, she was unable to pass the entrance exam for secondary school. So as an adult, she took a job harvesting produce on someone else’s land to provide for her children, but it was never enough. Now, after completing a buildOn Apprenticeship and being hired by buildOn as a skilled mason, Josile is paying for the education of her two sons and her daily necessities, and has been able to invest her earnings in her own land to grow whatever she needs – such as corn, root vegetables, and beans. buildOn Apprenticeships teach women constructions skills needed to work in trades that women have traditionally been excluded from in developing countries like Haiti. So far, ten apprentices have graduated from the masonry workshops. These graduates may get hired to work for buildOn, or may go to other local construction firms. 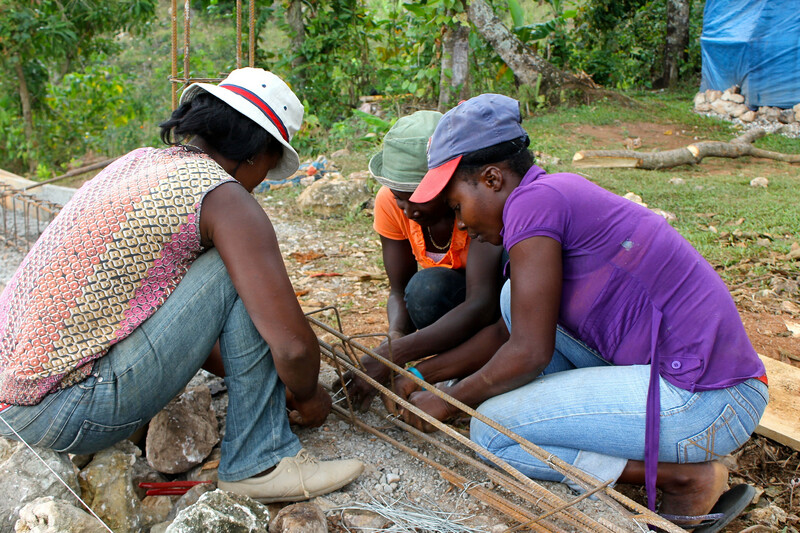 Soon, an all-women masonry team will start building schools in Haiti. The women trained in buildOn Apprenticeships succeed because they are determined to change their own lives. But, both men and women have the responsibility to identify and provide opportunities for women to grow – much like Bona, Nick and buildOn’s entire team in Haiti have.